Take the dried pepper and chop it up into fine pieces; discard the seeds if you don’t want the heat of the pepper (I wore rubber gloves to make sure I didn’t do something stupid like rub my eyes after dicing it). Mix all ingredients into a small sauce pan and cook over medium-low heat. Whisk until combined and heated through, coming to a light boil, then cover for a little while to really let the flavors mix. 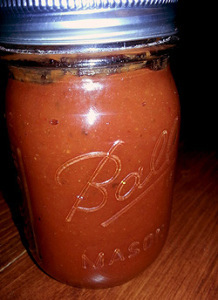 If you don’t use it right away, let the sauce cool a bit, pour it into a container with an air-tight lid and refrigerate. It should be used within a few months (if it lasts that long; I can’t imagine not using it up within a few days). We used about a third of the mixture and served it with some ribeyes and burgers. It was a last-minute plan to make the sauce and actually the smokiness tasted really good with the beef. I can only imagine what pork chops or ribs would be like with this sauce. It’s thick in texture, has a rich color and you don’t taste pumpkin but it has a subtle sweetness. The rest of the mixture was placed into mason jars—I just might have to make a double batch in a few weeks to give as gifts. After making the sauce, you’ll be left with about half a can of the pumpkin. My suggestion: homemade dog treats! It’s not difficult or very time-consuming. If you don’t feel like rolling out the dough and using cookie cutters, simply take a tablespoon of dough, roll into a ball, then smush it flat with the bottom of a glass. Pumpkin Dog Biscuits: I’ll admit, my dog isn’t real picky. But he loves these treats (click the title for a link to the recipe). The ingredients are basic and it’s a healthy indulgence. And instead of wheat flour, you can incorporate brown rice flour which is easier on some dogs’ stomachs. If you don’t have a dog, these are really simple to make and could be a gift idea for a friend/neighbor/teacher that does have one. It’s been about 4 weeks since I made this sauce. Opened up one of the jars today at lunch and put onto some chicken breast/tenders I nuked at work. Wow….not only really good, but as it ages it’s gotten a little more heat!